Spanish Dance students should have black heeled shoes (for Flamenco or Character Dance) and castanets. Girls should also bring a wide bottom skirt, mid-calf long, in any color (solid or print), with leotard and dance tights in black. (Soft ballet slippers may be needed additionally later on). 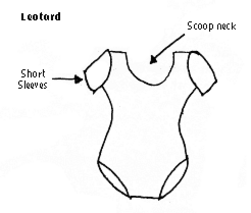 Ballet students should wear black leotard, tights and slippers. They will be on sale at the studio for $25.00 dollars the pair. You may also find them in specialized shops where they sell musical instruments, or "Menkes" dance store. Black Scoop Neck and short sleeves, for the girls. Any color T-shirt, for the boys. Black tights or leggings, for the girls. Black street or gym pants, for the boys. Black heeled Flamenco or Character Dance shoes with leather soles (please do not come to class with sneakers). Boys can use boots or black street shoes. Teenagers and adults should consider in the future, investing in proper flamenco shoes, which are imported and more expensive; but this is not necessary to start. The black generic heeled shoe for the young girls is just as fine. This shoe is used for all kinds of dancing, such as Tap, Jazz and Character Dance. Girls should bring a skirt in any color (solids, prints or polka-dots), which must be wide at the bottom, preferably with a ruffle, no longer than mid-calf. The ideal length is "just below the calf", with the bottom part of the leg, ankle and shoe clearly visible to the teacher. 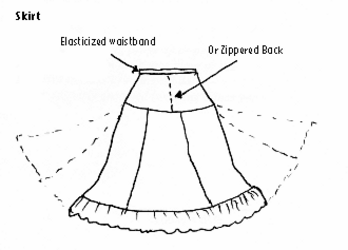 Teenagers and adults can use a longer skirt with ruffle, to the anklebone. Where can I buy the clothes, shoes and flamenco practice CD's? Menkes: 250 West 54th St, 4th floor (between Broadway and 8th Ave) New York, NY 10019; (212) 541-8401 - Flamenco shoes, clothing, accessories, CDs & videos. Freed of London: 21-01 43rd Ave. (corner with 21st St.). Long Island City, NY 11101 - Ballet & other dance shoes, clothing & accessories. On Stage Dancewear: 197 Madison Ave (bet. 34 & 35 St), New York, NY 10016; 1 (866) 725-1174 - Flamenco skirts & shoes, character shoes, ballet slippers & dance accessories. Sansha NYC: 888 Eighth Ave (entrance on 53rd St), New York, NY 10019; (212) 246 6212 - Flamenco skirts & shoes, character shoes, ballet slippers & dance accessories. Madeleine's Hosiery: 3014 Steinway Street Hosiery (close to 30th Avenue) Astoria, NY 11103, (718) 721-4338 - Dance leotards, tights, character shoes & ballet slippers. Luthier Music: 341 West 44th Street, New York, NY 10036, (212) 397-6038 - Solo Compás & Escuela de Flamenco/Christina Hoyos practice CDs, other Flamenco CDs & videos. Do students of the Spanish Dance School perform? Yes. At the end of the year, we have a Spring Recital which includes all serious and dedicated students, both children and adults, beginners through advanced. Are there any discounts for adults? Yes, if you sign up for the full course or purchases a 5-class or 10-class card. Please consult the printed brochure, visit The School's Class Schedule & Prices webpage, or contact us for more information. A new student may take a trial class for $25. If the student is then registered for the rest of the season's coursework, this will be considered a first day deposit and will be applied towards the student's tuition. The remaining balance is due on the second day of classes.